Effects Of Different Compressor Time Settings On Drums: These audio examples support Figure 9.9 in the book by demonstrating the audible effects of different attack-time and release-time settings on a snare-drum sound. The first file contains an unprocessed snare-drum sample (Ex09.01:WAV/MP3 ). This file (Ex09.02:WAV/MP3 ) demonstrates what the snare sounds like when processed at a ratio of 20:1 with fast attack and fast release times. Because the compressor reduces and resets the gain so quickly, the result is that the initial percussive transient is dipped in relation to the sound of the drum as a whole. The next file (Ex09.03:WAV/MP3 ) uses the same fast-attack 20:1-ratio compression, but with a longer release time so that the gain reduction resets negligibly during the drum hit. This means that all the compressor really does is reduce the level of the whole drum hit, rather than significantly affecting the hit's character, and were there any volume differences between the hits the compression would serve to even out this irregularity. If I now also increase the attack time to around 30ms, a small section of the initial percussive transient can sneak past the compressor before it has the chance to react, as you can hear in this file (Ex09.04:WAV/MP3 ). The end result is that the drum's sustain tail is reduced in level relative to its transient. Potentially Undesirable Side-effects Of Compressor Time Settings: Attack and release times which are too short can cause problems with bass instruments, because they track the slow-moving audio waveform, introducing potentially unwanted distortion. For example, in this file (Ex09.05:WAV/MP3 ) I've compressed the bass guitar fairly firmly at a 4:1, starting off with attack and release time settings of 0.3ms and 70ms respectively. As the file progresses, the time settings gradually shorten to end up at 1 microsecond and 1ms respectively. As this occurs, you can first hear the attack of each bass note being dulled, and then distortion creeping in as the compressor begins tracking the individual waveform excursions. Another side-effect of inappropriate compressor time settings can be a loss of low end on low-frequency percussion such as kick drums. Take this drum sample, for instance (Ex09.06:WAV/MP3 ). If I now compress that drum with a ratio of 20:1, using a 20ms attack time and an even faster release, you can hear how the sound's low-frequency weight suffers (Ex09.07:WAV/MP3 ). Parallel Compression: Parallel compression can be very effective for emphasising sustain without destroying transients and dynamic performance nuances. As such it can be very effective for drums, as in these two examples: Example 1 uncompressed (Ex09.08:WAV/MP3 ) and compressed (Ex09.09:WAV/MP3 ); Example 2 uncompressed (Ex09.10:WAV/MP3 ) and compressed (Ex09.11:WAV/MP3 ). 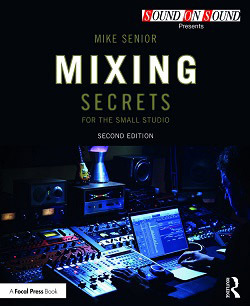 However, although the technique is best known for drum-processing, it also works very well for other instruments which carry important transient information, such as piano, harp, and guitar. By way of illustration, here's an example of a clean electric guitar recording without any compression (Ex09.12:WAV/MP3 ) which has then been treated to parallel compression to add warmth and sustain (Ex09.13:WAV/MP3 ). Using The Tonal Side-effects Of Compression: Different compressor designs have different tonal side-effects, although the differences between them are usually fairly subtle. For example, compare this uncompressed vocal phrase (Ex09.14:WAV/MP3 ) with the compressed versions from three different freeware analogue-modelling plug-ins: Digital Fishphones Blockfish 32-bit (Ex09.15:WAV/MP3 ), Tin Brooke Tales TLS3127LEA 32-bit (Ex09.16:WAV/MP3 ), and Tin Brooke Tales TLS2095LA 32-bit (Ex09.17:WAV/MP3 ) -- all three were compressing roughly the same amount. Chaining several compressors together allows you to combine these different tonal characteristics. Here, for example, is another uncompressed vocal section (Ex09.18:WAV/MP3 ), and here's the same section compressed with Fairchild 670 and Urei 1176LN compressor emulations in series (Ex09.19:WAV/MP3 ). You can get even more creative by running the processors in parallel instead, as in the following example: this section of uncompressed vocal (Ex09.20:WAV/MP3 ) has been processed with an array of five different compressors in parallel to generate this file (Ex09.21:WAV/MP3 ). Notice how the parallel approach has not only significantly altered the tone, but has also very effectively contained the dynamic range. Vocal Balancing: Here's a real-world demonstration of the roles of compression and level automation when setting the vocal balance in a mix. First of all, listen to this section of my full mix (Ex09.22:WAV/MP3 ) for this Mix Rescue project. Now compare that with this version (Ex09.23:WAV/MP3 ), where I've bypassed the level automation. Although there's still an enormous amount of compression being applied to the vocal, it's not as consistently upfront-sounding, because the processing just isn't intelligent enough to judge how audible the vocal needs to be within the context of the mix. If I switch out the compression too (Ex09.24:WAV/MP3 ) you can hear how the vocal struggles to hold a consistent place in the mix -- for example, given the lyric 'Heading for the rock stop at the front gate because I'm banned from the rock show', you can hear how syllables such as '-ing', 'the front', and 'be-' in particular are getting lost, which compromises the comprehensibility of the lyrics. 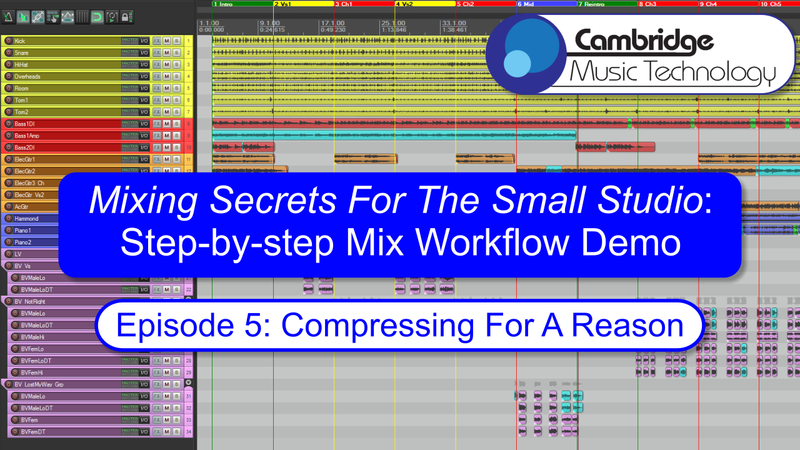 Affordable Compressor Plug-ins: Cockos's freeware ReaComp and Melda's freeware MCompressor are both excellent workhorse designs, with bags of user control For a simpler introduction to compression, try Tin Brooke Tales's TLS3127LEA 32-bit, which provides something like the Teletronix LA2A's control set. Beyond these more general-purpose suggestions, here are some compressors with a range of different tonal side-effects for you to experiment with: the freeware Antress Modern plug-in collection 32-bit; Digital Fishphones's freeware Blockfish 32-bit (but beware that it won't report its processing latency correctly to your DAW so it's less suitable for parallel-processing applications); Variety Of Sound's freeware Density MkII 32-bit, ThrillseekerVBL/LA/XTC 32-bit, and NastyVCS 32-bit; Solid State Logic's freeware LMC1 32-bit; Audio Damage's freeware Rough Rider ; Silverspike's freeware RubyTube 32-bit; Stillwell Audio's affordable The Rocket and Major Tom . Affordable Limiter Plug-ins: Georg Yohng's freeware W1 32-bit; Tin Brooke Tales's freeware Pocket Limiter 32-bit; and Sweetboy's freeware Volcano 32-bit; Kjaerhus Audio's freeware Classic Master Limiter 32-bit. If you need an additional level-reduction plug-in so that you can use mastering-style limiters for individual channel processing, then try GVST's freeware GFader or Sonalksis's freeware FreeG . How To Use Classic Compressors: Many small-studio owners have access to a variety of digital emulations of classic analogue compressor designs. But which emulations are best suited to which musical applications? This article provides some useful pointers.